From Natalie Cannizzo: Thank you for running such a great accounting program. I have felt very prepared not only for the work at the office and with clients, but also for the CPA exam. From Ryan Wolterink: Thank you for the great [Accounting] program and classes which set me up for success on the exam. Thanks again! Kendra Zantingh and Steve VanderVeen are teaching the Introduction to Management course this semester and creating a new course activity that provides students a venue to learn from Trinity’s alums. The purpose of BUAD 121 is to introduce students to the business disciplines (accounting, finance, management, marketing), the management functions (planning, organizing, leading, controlling), and to think about them from a Christian perspective. That means we also want students to better understand themselves and how they could engage business culture according to their gifts and calling. To do so we are creating an event we call “speed interviewing. What type of work do you do in your current role? What do you like most about it? What did you major in while at Trinity? How did that help you with the work you do? How would you characterize the culture of the organization? With the help of our alums we can accomplish our mission of empowering students to discern, develop, and deploy their gifts and calling! 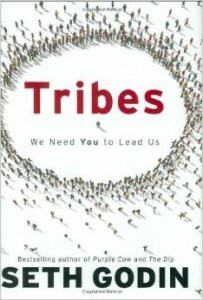 “A tribe is a group of people connected to one another, connected to a leader, and connected to an idea” (p. 1). “A group need only two things to be a tribe: a shared interest and a way to communicate” (pp. 1,2). “Human beings can’t help it: we need to belong. One of the most powerful of our survival mechanisms is to be part of a tribe, to contribute to (and take from) a group of like-minded people” (p. 3). “There’s an explosion of new tools available to help lead the tribes we’re forming….All of it is worthless if you don’t decide to lead” (p. 5). “Tribes are about faith — about belief in an idea and in a community. And they are grounded in respect and admiration for the leader of the tribe and for the other members as well” (p. 9). “Heretics are the new leaders. The ones who challenge the status quo, who get out in front of their tribes, who create movements” (p. 11). “Great leaders create movements by empowering the tribe to communicate. They establish the foundation for people to make connections, as opposed to commanding people to follow them” (p. 23). “What people are afraid of isn’t failure. It’s blame. Criticism” (p. 46). “Leadership is scarce because few people are willing to go through the discomfort to lead. This scarcity makes leadership valuable” (p. 55). “Change isn’t made by asking permission. Change is made by asking forgiveness, later” (p. 70). “Faith is the unstated component in the work of a leader and I think faith is underrated. Paradoxically, religion is vastly overrated” (p. 79). “Training a student to be a sheep is a lot easier than the alternative. Teaching to the test, ensuring compliant behavior, and using fear as a motivator are the easiest and fastest ways to get a kid through school. So why does it surprise us that we graduate so many sheep?” (p. 97). “Leaders don’t care very much for organizational structure or the official blessing of whatever factory they work for. They use passion and ideas to lead people as opposed to using threats and bureaucracy to manage them” (p. 22). “Managers manage by using the authority the factory gives them. You listen to your manager or you lose your job” (p. 22). [Leaders are curious persons who explore first and then consider whether or not he/she wants to accept the ramifications] (p. 63). [Managers are people who consider whether the fact is acceptable to his religion before he/she explores it] (p. 63). [Leaders ask for forgiveness] (p. 70). [Managers ask for permission] (p. 70). [Leaders have faith] (p. 80). [Manages have religion] (p. 80). [Leaders do things] (p. 87). [Managers have things happen to them] (p. 87). “The secret of leadership is simple: Do what you believe in. Paint a picture of the future. Go there. People will follow” (p. 108). “[The] art of leading is about following your heart” (p. 59). “Great leaders and great organizations are good at seeing what most of us can’t see. They are good at giving us things we would never think of asking for” (p. 60). “When we are inspired, the decisions we make have more to do with who we are and less to do with the companies and products we’re buying” (p. 74). 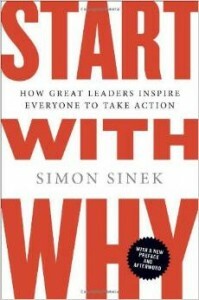 “It’s hard to make a case to someone that your products or services are important in their lives based on external rational factors that you have defined as valuable….However, if your WHYs and their WHY correspond, then they will see your products and services as tangible ways to prove what they believe” (p. 74). “The goal of business should not be to do business with anyone who simply wants what you have. It should be to focus on the people who believe what you believe” (p. 80). “Trust is not a checklist. Fulfilling all your responsibilities does not create trust. Trust is a feeling, not a rational experience. We trust some people and companies even when things go wrong, and we don’t trust others even though everything might have gone exactly as it should have. A completed checklist does not guarantee trust. Trust begins to emerge when we have a sense that another person or organization is driven by things other than their own self-gain. With trust comes a sense of value — real value, not just value equated with money. Value, by definition, is the transference of trust. You can’t convince someone you have value, just as you can’t convince someone to trust you. You have to earn trust by communicating and demonstrating that you share the same values and beliefs” (p. 84). “Leading…means that others willingly follow you — not because they have to, not because they are paid to, but because they want to….Those who lead are able to do so because those who follow trust that the decisions made at the top have the best interest of the group at heart. In turn, those who trust work hard because they feel like they are working for something bigger than themselves” (p. 85). “Cultures are groups of people who come together around a common set of values and beliefs. When we share values and beliefs with others, we form trust….That’s what a WHY does. When it is clearly understood, it attracts people who believe the same thing” (pp. 88, 89). “A company is a culture. A group of people brought together around a common set of values and beliefs. It’s not products or services that bind a company together. It’s not size and might that make a company strong, it’s the culture — the strong sense of beliefs and values that everyone, from the CEO to the receptionist, all share” (p. 90). “What all great leaders have in common is the ability to find good fits to join their organization — those who believe what they believe….Starting with WHY when hiring dramatically increases your ability to attract those who are passionate for what you believe” (p. 93). “The role of a leader is not to come up with all the great ideas. The role of the leader is to create an environment in which great ideas can happen” (p. 99). “When people come to work with a higher sense of purpose, they find it easier to weather hard times or even to find opportunity in those hard times” (p. 101). “[Only] when individuals can trust the culture or organization will they take personal risks in order to advance that culture or organization as a whole. For no other reason than, in the end, it’s good for there own personal health and survival” (p. 104). “For those within a community, or an organization, they must trust that their leaders provide a net — practical or emotional. With that feeling of support, those in the organization are more likely to put in extra effort that ultimately benefits the group as a whole” (p. 104). “The question is, how do you get enough of the influencers to talk about you so that you can make the system tip?” (p. 114). “Regardless of WHAT we do in our lives, our WHY — our driving purpose, cause, or belief — never changes” (p. 136). “As a company grows, the CEO’s job is to personify the WHY. To ooze of it. To talk about it. To preach it. To be a symbol of what the company believes….As the organization grows, the leader becomes physically removed, further and further away from WHAT the company does, and even farther away from the outside market…. [The] CEO’s job, the leaders’ responsibility, is not to focus on the outside market — it’s to focus on the layer directly beneath: HOW. The leaders must ensure that there are people on the team who believe what they believe and know how to build it” (p. 157). “The leader sitting on the top of the organization is the inspiration, the symbol of the reason we do what we do. They represent the emotional limbic brain. WHAT the company says and does represents the rational thought and language of the neocortex” (p. 158). Thank you for teaching me how to make a professional resume. I have received a number of resumes that have ranged from terrible to professional…and have been further assured that a professional looking resume plays a significant role in leaving a first impression. Thank you too for teaching me how to send professional emails. As many of these resumes have been attached to emails, I have also seen a wide range in the accompanying messages. I have found myself being most impressed by the people who have written with professionalism and have addressed me with respect as a potential employer…. On the flip side, I have received messages with mistakes in them or that are lacking professionalism that spark in my mind a thought of “this person isn’t the right fit for the job” even before I open their resume. These are just a couple of things that I have noticed recently that have reminded me of how grateful I was to have taken Professional Communications with you. The lessons that you teach in that class are extremely important and truly do make an impact in the working world.